Now that the holidays are over, the stores have become more quiet, and spring merchandise is trickling in. 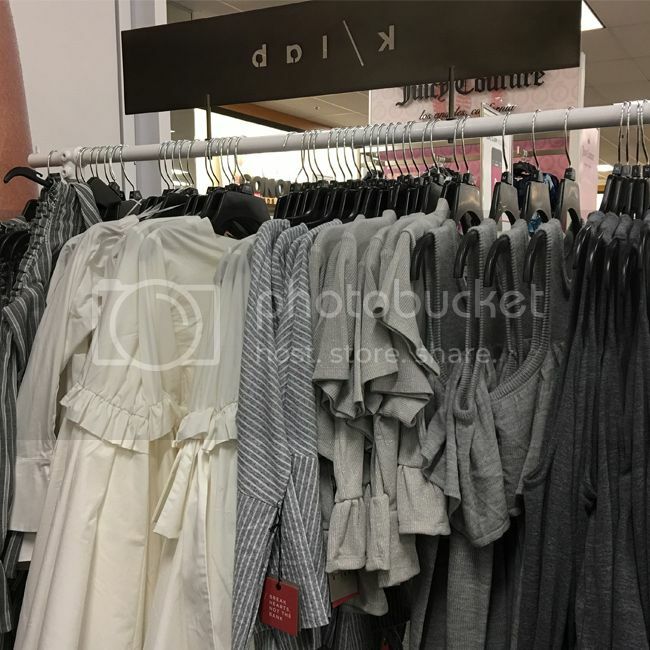 To take advantage of that, I headed into Kohl's for another peek at their new k/lab collection. 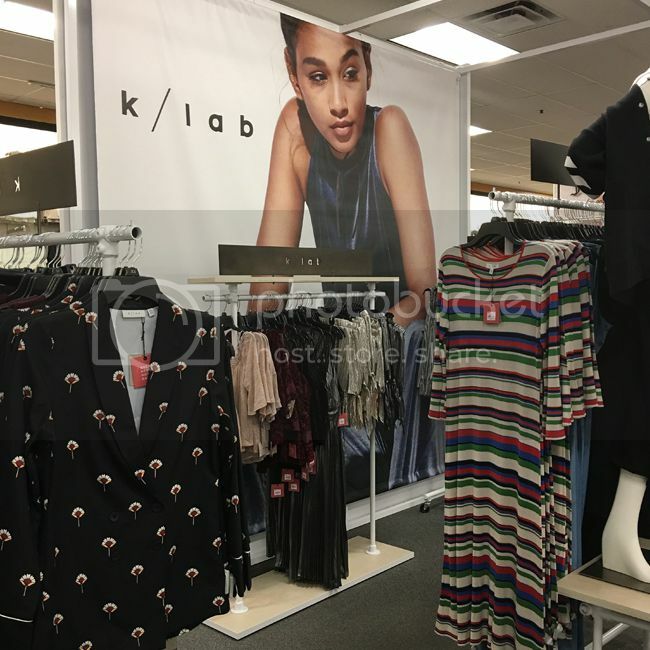 I can hardly believe that it's been two months since my I wrote my k/lab at Kohl's review, and fortunately, there's plenty of new merchandise to browse. If you aren't familiar with the collection, it's a trend-forward line of apparel aimed at millennials with most items priced under $78. Think of it as a cross between Topshop, Boohoo, and Forever 21. 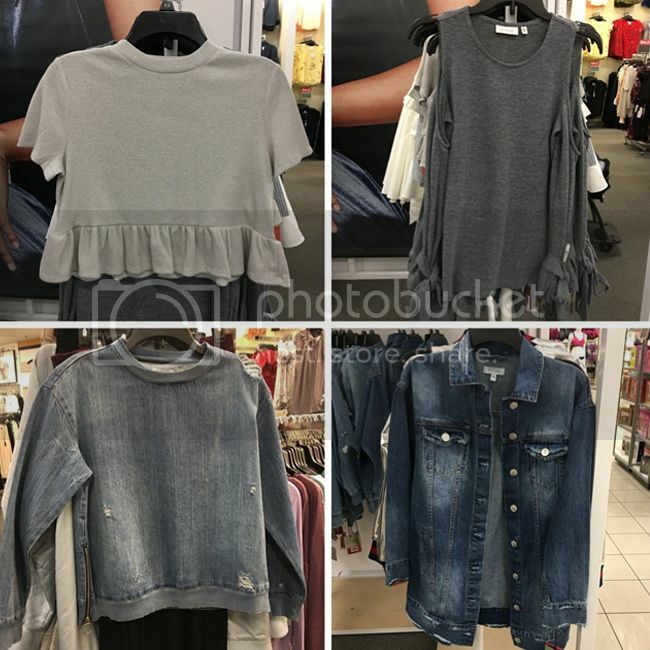 It's located in select Kohl's locations near the LC Lauren Conrad and Juicy Couture merchandise, and sizing is similar to both collections. Here's a look at the new arrivals this January. Above, track pants ($43.50) and a coordinating shoulder cut-out top ($28.50) speak to the athletic references that are dominating fashion right now. Colorful stripes are a key update for spring 2017, and this midi dress pictured above with bell sleeves ($51.00) is a fun way to try the trend. 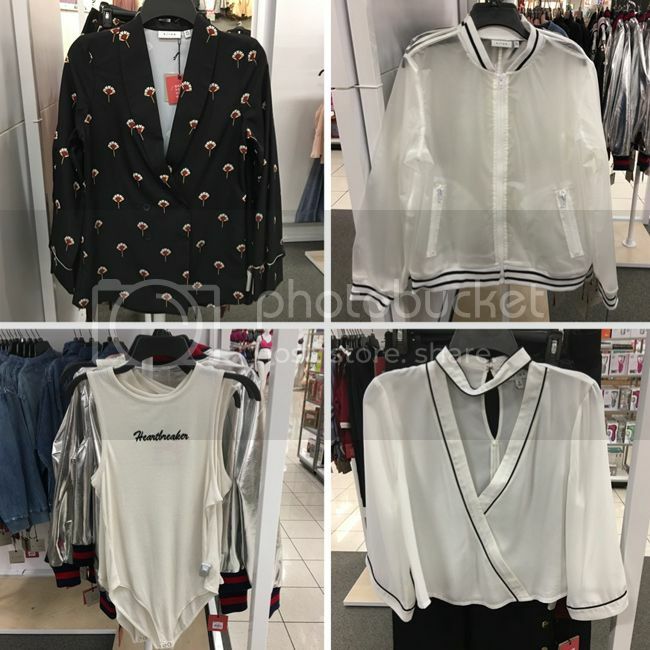 All the tops and blouses on this rack include of-the-moment details such as ruffles, shoulder cut outs, flared sleeves, and stripes. The collection was not advertised as being on sale, but the pants I bought rang up as 25% off. 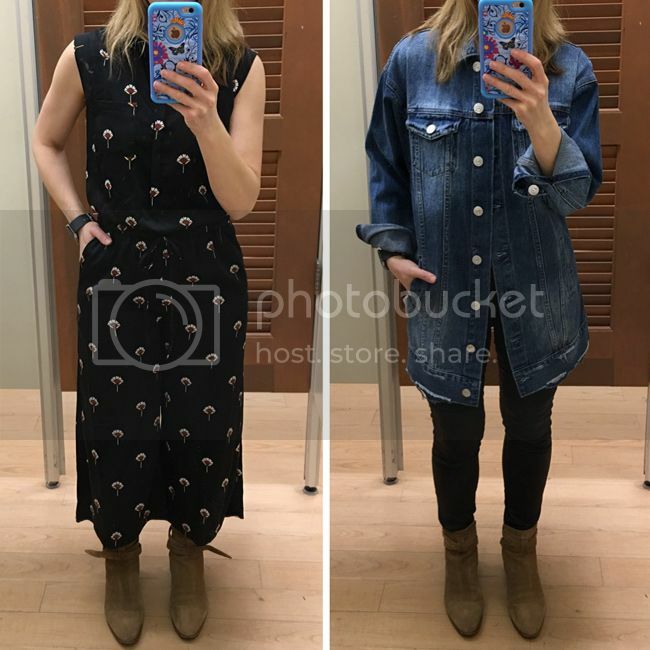 Also, the previous collection that I reviewed in November was marked on clearance on a nearby rack, with most pieces deeply discounted and under $40. 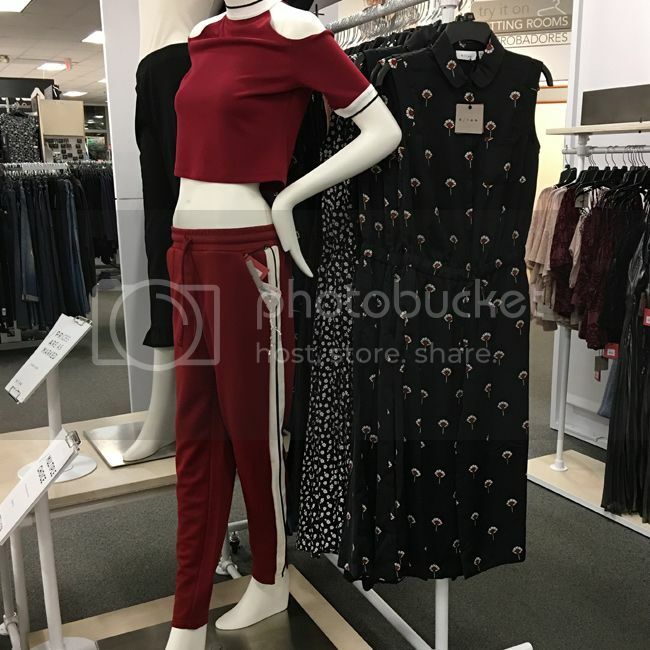 The clothing is displayed in themes, with denim pieces grouped together, metallics and evening looks on another rack, and sporty pieces on another rack. I brought a few pieces into the fitting room to create some looks. 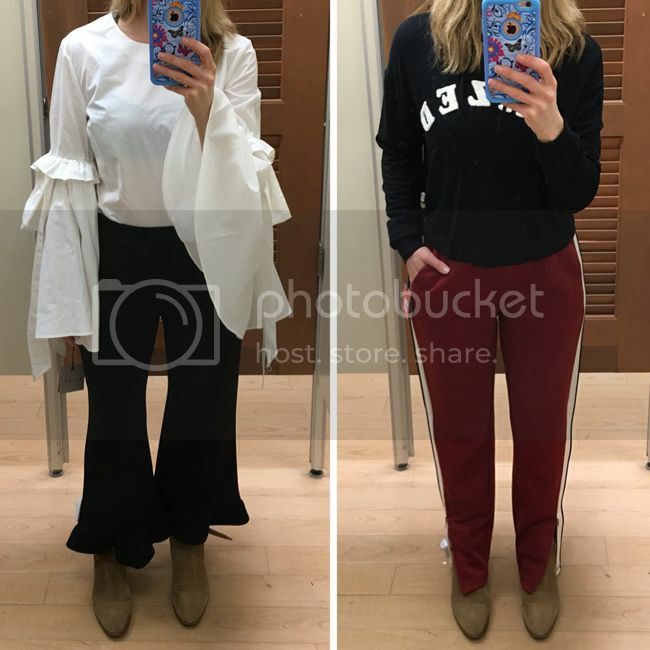 I'm wearing a size small in the knot flared sleeve blouse ($43.50) and a size small in the ruffle hem crop pants ($43.50). The blouse is a crisp, sheer cotton poplin with a back zip, and it's prone to wrinkles. It's cut straight and runs small through the waist. The pants are a soft knit poly/rayon/spandex blend with elastic waistband, making them very comfortable. I think they'd be more flattering on me with a less voluminous top and some heels. The "dazed" crop hoodie ($36.00) is a lightweight and stretchy piece made of rayon/spandex with a raw hem, while the track pants ($43.50) are thick, structured, and well made with pockets and ankle zips. Taller ladies might find the inseam too short on these pants. Both are size small and run true to size. I'm wearing XS in the printed jumpsuit and XS in the long denim jacket ($58.50) below. While the jumpsuit was true to size, the jacket runs big. I found the jumpsuit to be tricky to take off since the front buttons don't go down all the way to the waistband. It's a lightweight satin material with a tie elastic waistband. It also comes in a black/white floral print. The jacket was soft, thick, and had nice distressing details. The elongated trucker jacket is a key update for 2017, and this one can be styled in many different ways. Petites could wear it as a dress, and the layering options make it an ideal winter-to-spring transition piece. 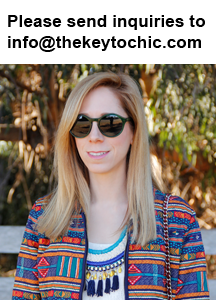 For more shopping reports, trend forecasts, and style inspiration, catch up with me on my Instagram and Snapchat stories @thekeytochic.